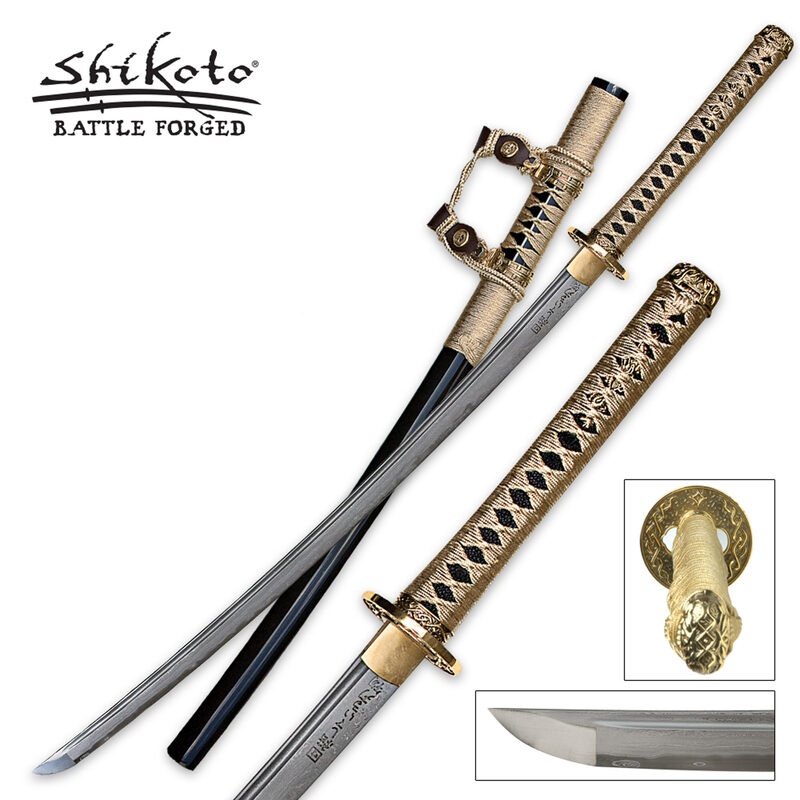 Shikoto Black Kogane Dynasty Forged Tachi Sword Damascus | BUDK.com - Knives & Swords At The Lowest Prices! Only United Cutlery could recreate this breathtaking Gold Kogane Dynasty Forged Damascus Tachi in such dramatic detail. From the striking patterns of the heat-forged Damascus steel blade to the gleaming brass accents, this katana abounds with detail and style. The powerful blade bears a laser etching that translates to "United Strong Steel, " evidencing the supreme power of these Damascus blades, each of which is folded nine times to 1792 layers. This sword is absolutely stunning and powerful. I was not a die hard katana fan but this sword instantly became my favorite sword in my collection. I haven't got to really test it but it was strong enough to cut through an old broom handle like it was nothing. If you're thinking of buying this sword do it you will not be disappointed. A blade that is made of fine craftmenship. I got the sword thrre days ago and budk never got me unset or disappointed at all, but anyways thank you for creating a sword this majestic and outstanding with a golden tsuba on it. I named it the Golden Star after i got it and i gotta say...IT FREAKING EPIC!! I just received my Shikoto and I am very pleased. This sword is not only most handsome but it appears ready for battle. The fittings are tight and the edge is ready to shave! Honestly I bought this sword to add a little diversity to my collection, and I was not disappointed. Although it is not my favored sword for the feel, it is my favorite for the looks. The pictures do not do this sword justice, it is truly beautiful and breathtaking. It feels solid and sturdy and is slightly heavier than some of my other Katanas but it doesn't feel unbalanced. The blade came quite sharp and well oiled. Overall I would say this is a great buy for anyone who wants either a decorative or a functional piece. Awesome! 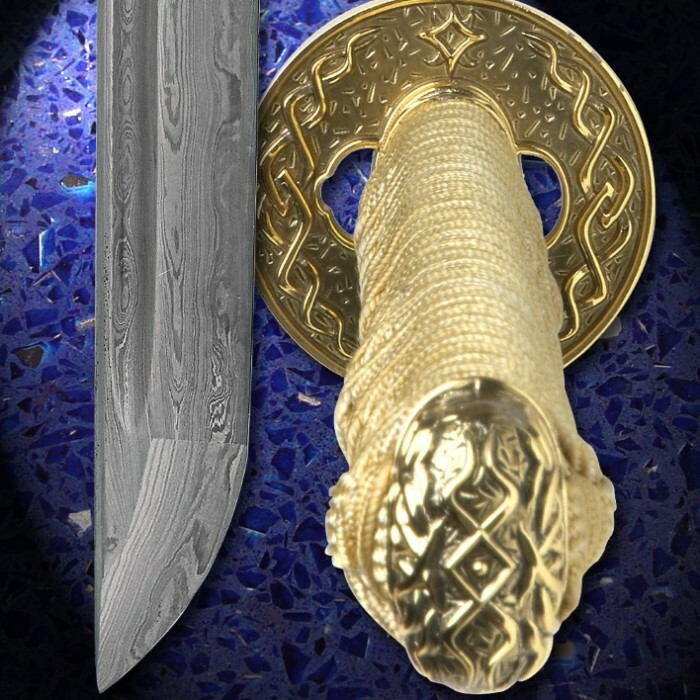 This is one beautiful sword and my second United Damascus sword in my collection, which both are quality works of art. A sword worthy of ceremonial and public martial arts exhibitions. Sharp out of the box and ready to slice. I have no regrets on this purchase and would recommend it to friends. I bought this sword for my brother for his birthday. He says that it is awesome. Its his favorite blade to date. it is his first damascus blade sword. it is a very well crafted blade, with a well made handle and sheath for it. great buy for the price. The shipping was fast as always, the sword is beautiful and lite. I just wished it was sharpen than it came but thats not a problem u can always sharpen it your self, I had it for a month and nothing wrong with it, I absolutely love it its my fav sword, its way better than in the pix and the gold makes it waaaaaay cooler. Best 200 bucks i ever spend. great sword sharp blade cant go wrong very balanced sword worth every cent this is what a sword should be!!! !